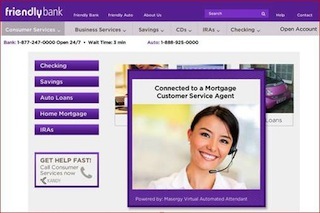 The MSP targets Web sales and support organizations with its first browser-based, communications-enabled Virtual Automated Attendant. The slow but steady uptake of WebRTC continues on, with managed services provider Masergy Communications becoming one of the latest companies to offer support for browser-based, real-time communications. Masergy sees WebRTC as a natural next step for the UC cloud service it began offering in 2004, said Dean Manzoori, the MSP's vice president of product management. Over the years, he explained, Masergy has expanded its UC cloud portfolio from basic telephony to include communications functionality such as instant messaging and presence, audio conferencing, video conferencing, and Web collaboration. In addition, Masergy also enables integration between its UCaaS offering and popular business process applications like Salesforce, NetSuite, and Zendesk. "Lately what's been taking up a lot of my product mindshare is WebRTC and how to integrate that with our UCaaS solution," Manzoori told me. As announced last week, the WebRTC capability comes as part of the new Virtual Automated Attendant (VAA), which is customizable via a self-service portal. An application wizard helps site managers create custom menu structures, and then auto-generates the necessary code for embedding the visual audio attendant and click-to-call buttons, Manzoori said. Initially, Masergy's focus is on real-time voice communications for sales and support functions, which the company utilizes for its own purposes as shown in the image below. 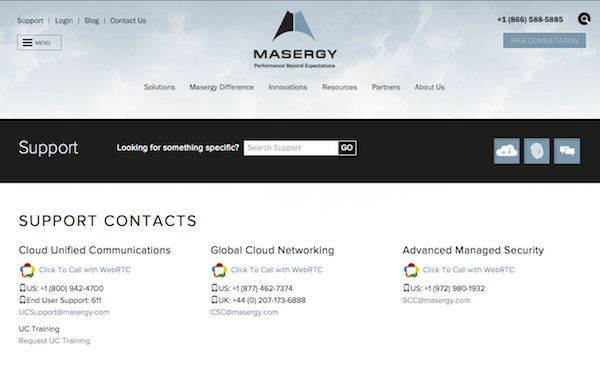 Since the beginning of May, Masergy had received about 150 WebRTC calls through its support website, Manzoori told me when we spoke earlier this week. Calls placed via the WebRTC-enabled VAA originate in the visitor's browser (Chrome, Firefox and Opera) and terminate on an existing Masergy SIP endpoint. Site visitors using a browser that does not support WebRTC receive a prompt to download a plug-in, Manzoori said. The VAA portal will be live as of next week, at no additional charge for UCaaS customers, he said. "WebRTC provides an easy way for our customers to add another dimension to the way their customers reach them." Sales and support organizations that adopt WebRTC-based communications can expect to see lower operational costs as they transition from toll-free numbers to browser-based call support, Manzoori said. He cited the average going rate for a toll-free call at about two cents per minute compared to a sub-penny rate for WebRTC calls. "But, adding WebRTC isn't just about cost-savings," Manzoori said. "It's about making people more productive, creating a better customer experience, and reducing time-to-resolution from the contact center."